Liverpool are reportedly among the clubs ready to fight it out for the transfer of Ajax defender Matthijs de Ligt in the summer, along with their Premier League rivals Manchester United and Chelsea. Barcelona and Manchester City are also talked up as potential contenders for the young Dutchman’s signature after his remarkable rise in the Eredivisie in recent times. This latest speculation comes from Don Balon, who state Liverpool are among the clubs interested in De Ligt, rated by Ajax at around €70million. The 19-year-old is one of the best young players in the world and looks a necessary signing for Liverpool after their recent struggles at the back. 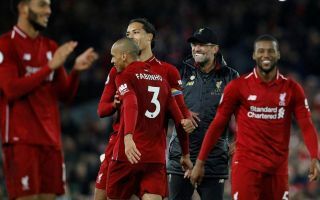 The Reds started this season in rock-solid form thanks to the partnership of Virgil van Dijk and Joe Gomez, but the latter has been a big miss through injury. Dejan Lovren and Joel Matip don’t really look good enough as backups, so bringing in De Ligt could be a fine solution to this problem. United also need to strengthen at the back, however, so it’s little surprise to see them linked by Don Balon with a player who’d be a clear upgrade on the likes of Chris Smalling and Phil Jones. Chelsea, meanwhile, could probably also do with a long-term replacement for David Luiz, whose form has been up and down this term.